Making your partner feel like royalty every once in a while will do wonders for keeping your relationship happy and healthy. Pamper her with a stunning bouquet, and watch her light up. 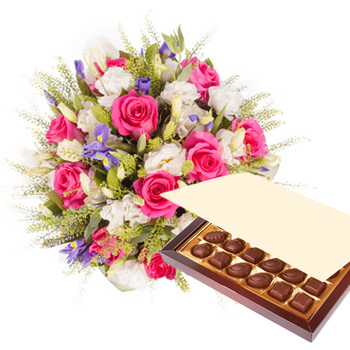 Your recipient will receive a breath-taking bouquet of charming pink Roses, white Eustoma, exotic purple Iris, filled out with Greenery, accompanied by a box of the finest Chocolates. Thank her for being her, say I Love You, or invite her to a romantic get away with Princess Pink.